This week, I've been working on a bunch of projects, thanks to three days snowed in - like much of the east coast. I feel much more confident going into February! My brother's birthday is soon. He's a minimalist kind of guy, and while he often encourages my crafting and appreciates my quilts, he insists he doesn't need anything else but the t-shirt quilt I made him a couple years ago. 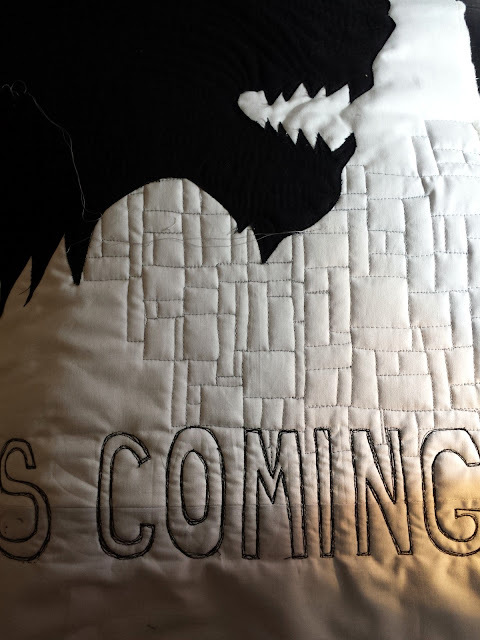 We started talking once when he was visiting, and he admitted that a Game of Thrones wall-hanging would be pretty rad. I said "I'LL MAKE IT" faster than he could even consider his words. He left the colors up to me ("uh... whatever is normal" - his response when I texted him - fine with me :) ). Black seemed especially captivating for the wolf head and words. I sewed together two different Northcott solid grays (they are SO SOFT) for a bit of a background contrast effect. The big fun for this mini quilt was the background quilting. 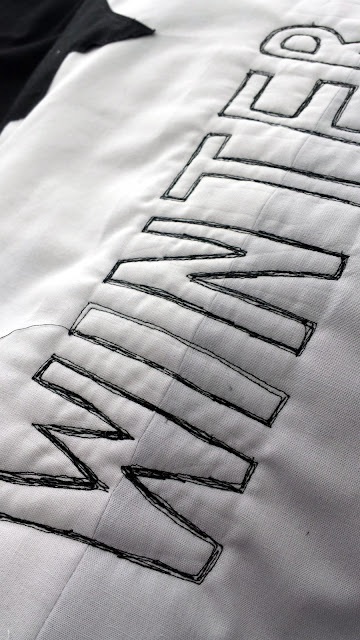 Instead of taking the time to applique letters, I decided to "wing it" (my favorite) by tracing the letters with my Hera marker and quilting them instead. I came up with a pretty easy way to make them stand out more with sketch quilting (I'm sure I haven't invented this particular method, but I haven't read anything about my approach before). It's easy and fun, but it does require some intermediate free motion quilting control. Practice, practice!! I decided to quilt another part of the background with this building bricks motif. I love the look of sharp, angular quilting for this fierce quilt (literally fierce - that's a wolf head, people). I will happily film and/or write up a tutorial for this if anyone is interested! More on the inspiration/choices behind this quilt once it's gifted... I've just got the binding and label left! Your brother should be pleased with his wall hanging, and very masculine too. My husband would love this. The quilt looks great so far. Hahahaha "whatever is normal" that is perfect. 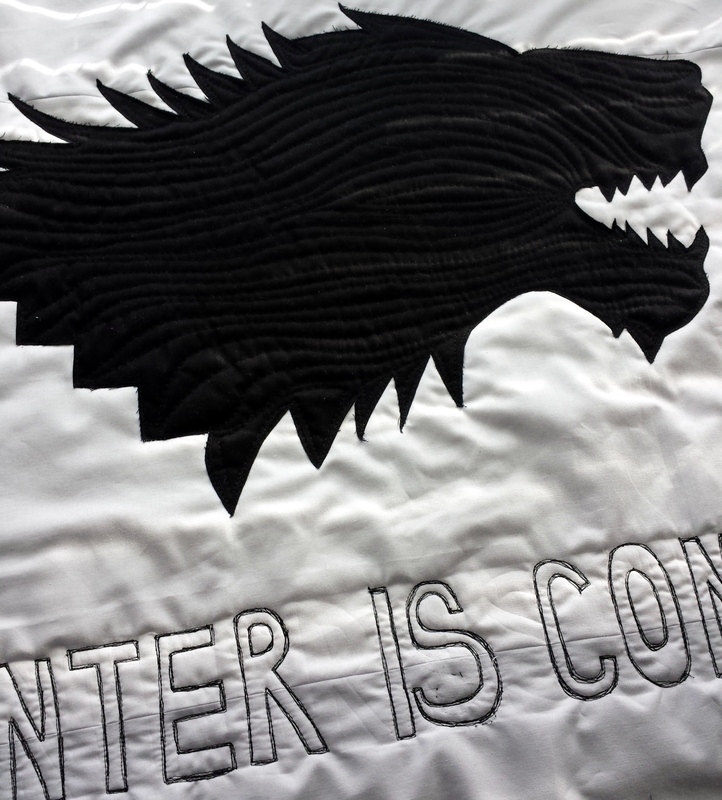 Love the quilting on the wolf and the muted background quilting! This is looking amazing! Your brother is going to be thrilled. I watched the tutorial; those sketch letter are so cool. The sneak peeks are stunning! Can barely wait to see the finished project. That sketch quilting is new to me. How cool to outline that figure with it? Looking like it had been sketched on there (to state the obvious!). Great idea. Great quilting project. Thank you for all the useful hints and tips.